GTA IV Episodes, Episodic Content, or Downloadable Content are expansion packs for Grand Theft Auto IV that add extra missions, areas, weapons, characters, and more to the original game, as well as a new storyline that interweaves with the main GTA IV one. Currently, both episodes are available for the Xbox 360 version of the game, along with the PlayStation 3 and PC ports which were released several months later. If downloaded online, each episode requires the original GTA IV game disc in order to be played, but doesn't require the disc if the Episodes from Liberty City game disc is used instead. The game retails for £34.99 in the UK, $39.99 in the US and €29.99 in Europe. The Lost and Damned, featuring Alderney biker Johnny Klebitz and The Lost Brotherhood. - Released February 17, 2009. The Ballad of Gay Tony, featuring Dominican criminal and bodyguard Luis Fernando Lopez and his boss Anthony "Gay Tony" Prince. - Released October 29, 2009. 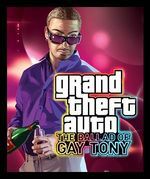 Both The Lost and Damned and The Ballad of Gay Tony were also released together on a single boxed game disc called Episodes From Liberty City, on October 29, 2009. 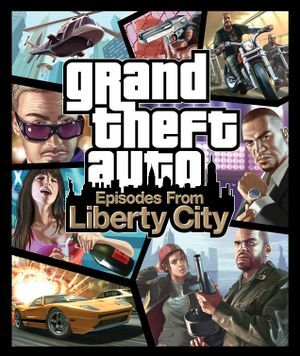 Unlike the individual episodes, Episodes From Liberty City doesn't require the original GTA IV game. The disc includes three new radio stations exclusive to the double-pack version to compensate for some music not carried over from GTA IV. The single-episode DLCs do not contain exclusive music, but the original music is been carried over. Players who do not have GTA IV installed on their console will find that some phone conversation dialog in Episodes From Liberty City is missing. If you were to download any episode online and save a game using TLAD or TBOGT in the original GTA IV, and then later use the Episodes from Liberty City game disc, the saved games will still be available, however, the GTA IV saved games will not be. Following its release, Episodes from Liberty City was eventually made available in a "Complete Edition" bundle with GTA IV. Episodes from Liberty City also introduces three aforementioned exclusive radio stations; Vice City FM, Self-Actualization FM and RamJam FM. However Vice City FM replaces The Vibe 98.8, Self-Actualization FM replaces The Journey, and RamJam FM replaces Massive B Soundsystem 96.9 and Tuff Gong Radio. On January 29, 2010, Rockstar officially announced that both expansion episodes would be released for the PlayStation 3 and the PC on March 30th. However, due to having problems with Sony Europe with the Liberty City radio, television, and Internet content, the episodes had been delayed until April 13th in North America and April 16th in Europe. Like the previous release on Xbox 360, each episode was been made individually available online at the PlayStation Store and at Games for Windows - LIVE Marketplace, as well as together on disc. The Lost and Damned and The Ballad of Gay Tony lack features which were present in Grand Theft Auto IV, most noticeably the ability to buy clothing from the various shops, which are inaccessible. Another feature that has partially been taken away is the ability to date. The player can pick up women in clubs in The Ballad of Gay Tony, but they can't be dated. New features like clubs, new radio stations, TV shows, and the new vehicles and weapons were implemented instead. On October 18th, 2010, the 3rd Civil Court of Barueri, in São Paulo State, in Brazil, has decided that the game "Episodes From Liberty City" violates the Brazilian law concerning copy rights by using a song called "Bota o dedinho pro alto", from the Brazilian composer Hamilton da Silva Lourenço in the game without his permission. In the decision the court ordered that all copies of the game for Playstation 3, Xbox 360 and PC should be recalled from stores. The decision also states that if the game is not recalled in 48 hours Rockstar Games should be billed in R$ 5,000.00 (approximately USD 3,125.00) per day. According to the claimant lawyer this decision should be fulfilled in the US too because it's where Rockstar is located. Rockstar can still appeal to the State Court of São Paulo and other superior courts although the decision is to be taken imediate action. This page was last modified on 16 January 2013, at 22:44.